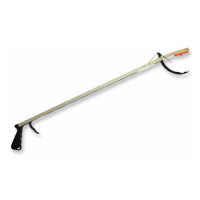 A range of litter pickers and bag holders for the effective cleaning of rubbish from open areas such as parks, playgrounds or shopping precincts. This economy litter picker / reaching aid makes picking up litter and ..
Makes litter picking easy as this litter bag holder will hold all wast.. The deluxe quality litter picker picks up litter and larger objects ea..